View Homes for Sale – Photos, Maps, Visual Tours, Details. View our listings, as well as all homes for sale in the Multiple Listing Service, with one click. I’ve been saying it for weeks now… our inventories are LOW! Lower than I’ve seen in a long time here along the front range, in Longmont, Fort Collins, and throughout the Denver Metro. 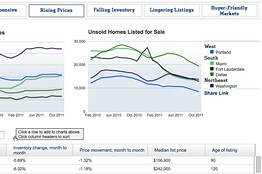 We are seeing our days on the market shrinking for properly priced, non-short sale listings. If you’ve ever thought about selling, now is a good time to give me a call… let’s chat about your neighborhood. But appearances can be deceiving, and it remains to be seen whether the drop is the beginning of a real recovery or if inventory is being held down by sellers waiting for prices to pick up and banks moving slowly on foreclosures. The 1.89 million homes on the market at the end of December represented a 6% decline from November and a 22.3% decline from one year ago, according to data compiled by Realtor.com. Low inventories are an important ingredient for any housing recovery because prices could firm up in markets that have worked through their inventory. Still, some real-estate agents aren’t celebrating because there’s a large backlog of potential foreclosures that haven’t yet been taken back and listed by banks. The inventory declines are particularly pronounced in certain states where banks have sharply slowed down foreclosures to correct document-handling abuses. Moreover, some sellers have pulled their homes off the market to wait for a turn in prices, and that “pent up” demand from sellers could keep inventories higher once prices do rise. Inventories were down for the year in all but one of the 145 markets tracked by Realtor.com, with Springfield, Ill., posting the only year-over-year inventory gain. The largest declines were recorded in Miami (-49.7%), Phoenix (-49.1%), and Bakersfield, Calif. (-46.6%).